Is it saving space in our landfills and reducing plastic production, or is it just gross? 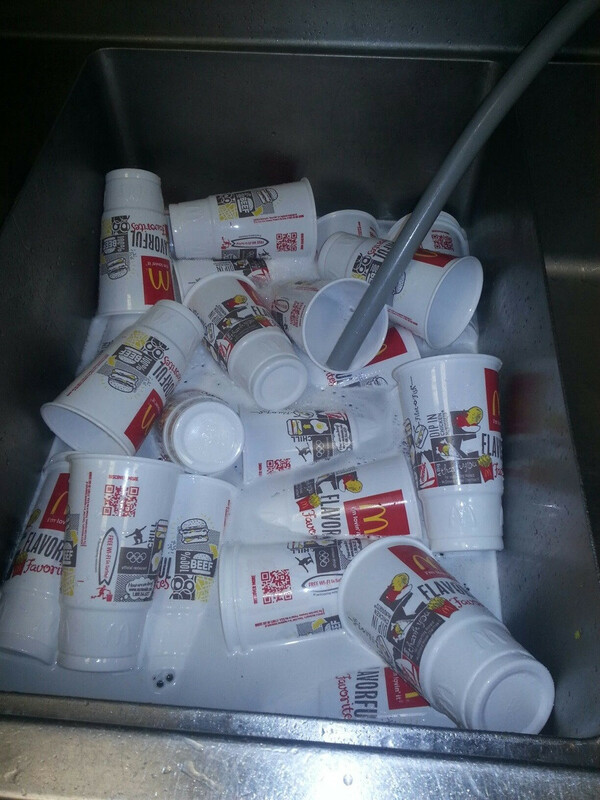 A McDonald's employee has uploaded a photo of his restaurant cleaning used soda cups. He says that cups thrown away or left out in the restaurant are washed and re-used to serve drinks to customers. A lot depends on the actual cleaning process, but if that process is adequate for sanitizing the cups, it is really no different than a restaurant that serves drinks in glasses and washes them, right? I will now punch holes in every Mickey D's cup I use. YUCCCCH! And with that...I will no longer eat McDonald's. This...is ridiculous. I am all for recycling. If they collect the cups for recycing and send them in to be recycled that is great! But to wash cups?? When they have difficulty maintaing a bathroom I think not. If they really want to cut down go back to the paper cups, get rid of the Plastic and foam. That is gross. Plus, I feel like finding a McDonald's in the United States is easier than finding a plumber in Toronto. And if every McDonald's is doing that, I don't think I'll ever get a drink from them again. And we trust the worker is honest? Prank?